The Canada Lynx (Lynx canadensis) is well suited for the living in the snow and here at the Minnesota Zoo. Their long legs allow them to stay above snow drifts, large furry feet act as snowshoes, and their extra-thick fur keeps them warm as well as silent in the wild. Lynx fur can also vary from a yellowish-grey to a rusty reddish-brown as the seasons change. 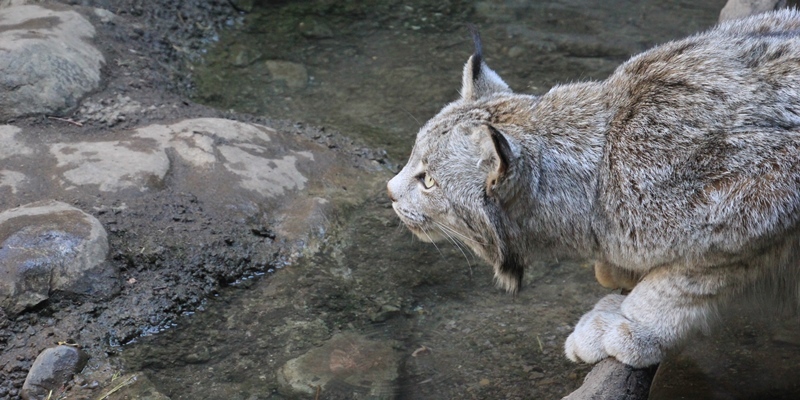 Lynx typically inhabit northern forests, in countries such as North America, Europe and Asia, their adaptations to snow will serve them in these conditions. Like most cats, they are generally resting during the day, usually out of sight under a rock ledge or a fallen log. Lynx hunt by stalking and pouncing on their prey because of these hunting techniques their paws have retractable claws to capture such prey. These claws are also used for fighting and climbing to escape predators. One of the lynx most common preys is the snowshoe hare. These hares are not only a source of food but also a population growth tool for lynx. Lynx population numbers go up and down as snowshoe hare populations change. Protecting the lynx is just as important as protecting the hare.